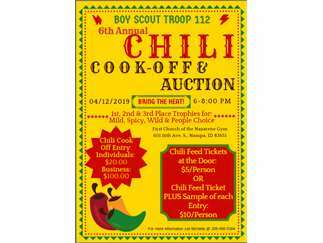 On Friday, April 12th 2019, from 6-8 pm, Troop 112 will be hosting their 6th annual Chili Feed Cook-off and Auction at Nampa First Church of the Nazarene, 601 16th Ave South in Nampa. We have many people submit their unique chilies and those in attendance get a choice to sample and vote for their favorite for $10 a person or a chili dinner provided by Moon’s Kitchen, 712 W Idaho St, Boise for $5 a person. While enjoying a chili dinner with all the fixings, those in attendance also get to participate in a silent and a live auction. For more information, or to find out how you can submit a chili for judging, please visit our website at www.troop112nampa.org.